These days when I have free time and I'm at home I always toss up in my head "Should I play Sims 4, or should I write blog posts?" And man, it's hard to choose sometimes. My compromise? I often write my blog posts while watching Let's Play videos of Sims 4 on youtube... Haha. Does anyone else still have an unhealthy obsession with the Sims franchise?! The games are just so addictive! Anyway, from everything I've said so far you would think these nails have something to do with The Sims, but... They don't, at all. Haha. I just wanted to let you know how I felt when I sat down to write this post. :) So let's get into the info and pics about this look! 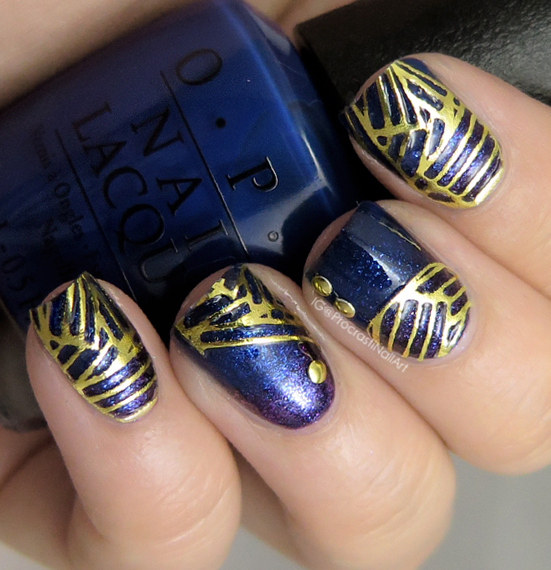 These Golden Angle Nail Wraps have been sitting in my drawer for over a year (I originally picked them up in my January 2016 box) so I finally decided to sit down and use them. So I started out with a base of OPI Eurso Euro and then I sponged on a rough gradient with OPI Cosmo With a Twist and OPI Give Me Space. After applying my gold decals I sealed the whole thing with a layer of top coat, and then added a few metal studs for extra visual interest. Have you tried nail wraps like these from Julep before? If so, what did you think of them? They look good! I like how they look too. Seriously. This post spoke to my soul. I am SO obsessed with the Sims (all versions), lol, and those nails are such a great combination! 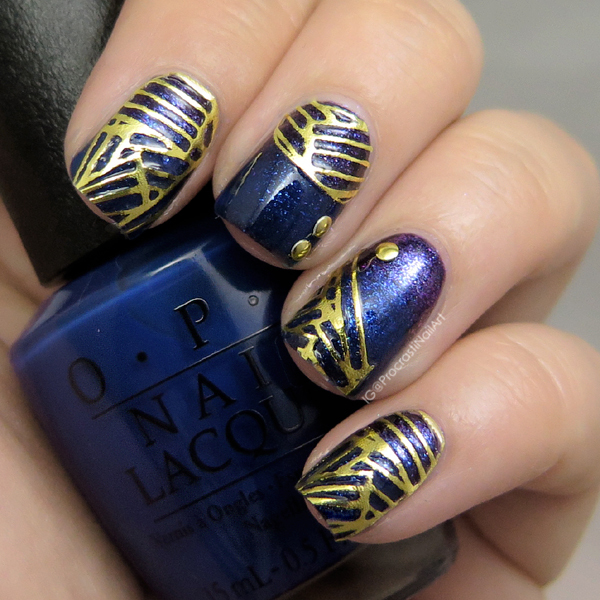 I love navy blue and gold. Perhaps my next nail design will have to incorporate those two colors! 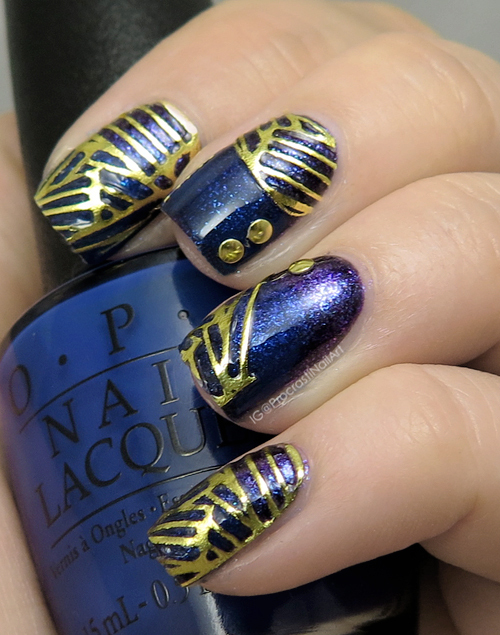 Those nail wraps are cool! These look really cool! I like the base colour you decided to combine with these. Never used these types of nail wraps but the look pretty cool. I know how you feel about wanting to write blog posts and do other things. Lately netflix has been winning out over blogging for me. I'm seriously considering getting another monitor setup so I can do both. These wraps look really cool. They remind me of some I've seen at sally's that Ive been contemplating picking up. If I do I hope they apply as easily as these did for you.